Here’s a fun fact: our founder Sarah loves to cook Thai food! So it makes sense that our Thai Coconut flavor was developed to taste like the best ever Thai green curry, redolent with lemongrass, ginger, herbs and lime leaves. 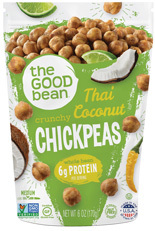 Thai Coconut chickpeas are such a flavor party in your mouth that you’ll want to snack on them all on their own, but they actually add a serious zing to salads of all kinds.